Understanding the in vivo fate and transport of nanoparticles (NPs) is challenging, but critical. We review recent studies of metal and metal oxide NPs using the model organism Caenorhabditis elegans, summarizing major findings to date. In a joint transdisciplinary effort, we highlight underutilized opportunities offered by powerful techniques lying at the intersection of mechanistic toxicology and materials science. To this end, we firstly summarize the influence of exposure conditions (media, duration, C. elegans lifestage) and NP physicochemical properties (size, coating, composition) on the response of the worm to NP treatment. Next, we focus on the techniques employed to study NP entrance route, uptake, biodistribution and fate, emphasizing the potential of extending the toolkit available with novel and powerful techniques. 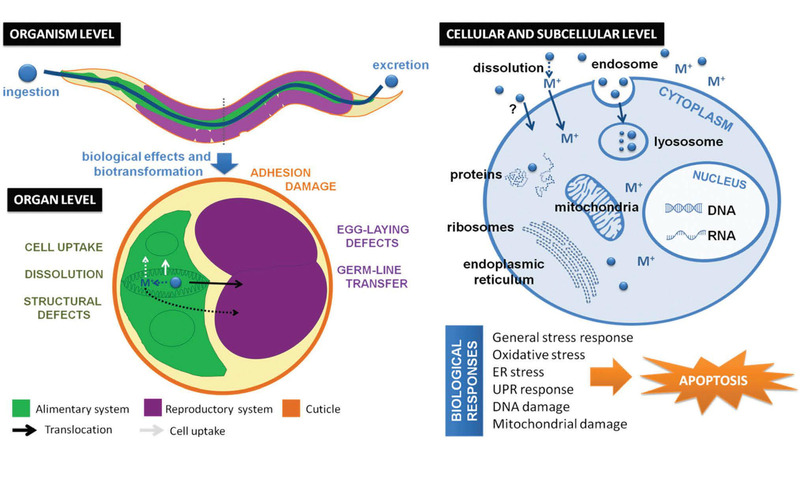 Next, we review findings on several NP-induced biological responses, namely transport routes and altered molecular pathways, and illustrate the molecular biology and genetic strategies applied, critically reviewing their strengths and weaknesses. Finally, we advocate the incorporation of a set of minimal materials and toxicological science experiments that will permit meta-analysis and synthesis of multiple studies in the future. We believe this review will facilitate coordinated integration of both well-established and underutilized approaches in mechanistic toxicology and materials science by the nanomaterials research community.